French Chocolate Chips and Cherry Clafoutis, my take on the classic summer dessert. Superbly scrumptious and light, with an almond custard-like taste and texture, this is one of those quick easy desserts that never fail to impress. Clafoutis is a French dessert that has a sweet batter with the consistency of a flan. Traditionally, clafoutis is made with black cherries, and usually pits are not removed. They are said to contain the active chemical in almond extract, which is released during baking, thus giving the clafoutis a distinctive almond flavour. Now, while this sounds rather yummy, l would recommend you remove the pits if you have small kids, l would not trust they can easily remove them. Instead, you can add almond extract to the batter, and also some ground almond, for extra flavour. 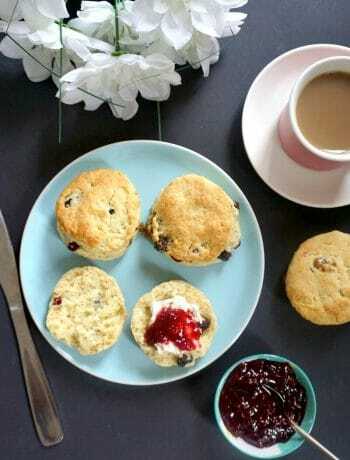 The taste can be enhanced also by using vanilla extract, they both work beautifully here. If you google the term clafoutis, you might find the very slightly different spelling too, clafouti, but it really is the same delicious and finger-liking dessert. 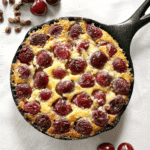 How do you make a French Cherry Clafoutis? If you wonder what have chocolate chips to do with cherry clafoutis, well, they are not usually used here. But this does not mean we cannot make the dessert our own and add them. After all, chocolate chips can only make it super douper yummy. They will not hold their shape during baking, like they usually do in cookies, they melt nicely and bring extra sweetness. It has occured to me that l have not made a dessert for a while now, all my latest posts are either main meals, snacks or salads. It had to be rectified, really. When you make the batter, this is pretty runny, unlike most cakes, where the batter is way more consistent. It’s even thinner than the crêpes batter, but that’s not a problem really, it’s meant to be this way. I have long researched a cherry clafoutis recipe, l wasn’t verry happy with any, either ridiculous amounts of sugar, or butter. Ripen cherries are naturally sweet and juicy, so tons of sugar is really unnecessary. Especially since chocolate chips are added too. I found some amazing cherries in town the other day, and bought a 2 kg box, which was pretty silly, since only myself and my little one like fruit, my husband is not that keen on them. If you’ve liked my FRENCH CHOCOLATE CHIPS AND CHERRY CLAFOUTIS or any other recipe on the blog then don’t forget to rate the recipe and let me know how you got on in the comments below, I love hearing from you! You can also FOLLOW ME on FACEBOOK, and PINTEREST to see more delicious food and what I’m getting up to. Brush the bottom of a skillet (mine is a smaller 6 1/2 ") with butter, then sprinkle a tablespoon of granulated sugar over. In a jug whisk together the milk and egg, salt and one tablespoon of melted butter, then add the almond and vanilla extract. In a large bowl, sift in the flour, add the sugar and ground almonds and mix well to combine. Make a well in the middle of the dry ingredients and gradually whisk in the liquid until you get a lump-free batter. 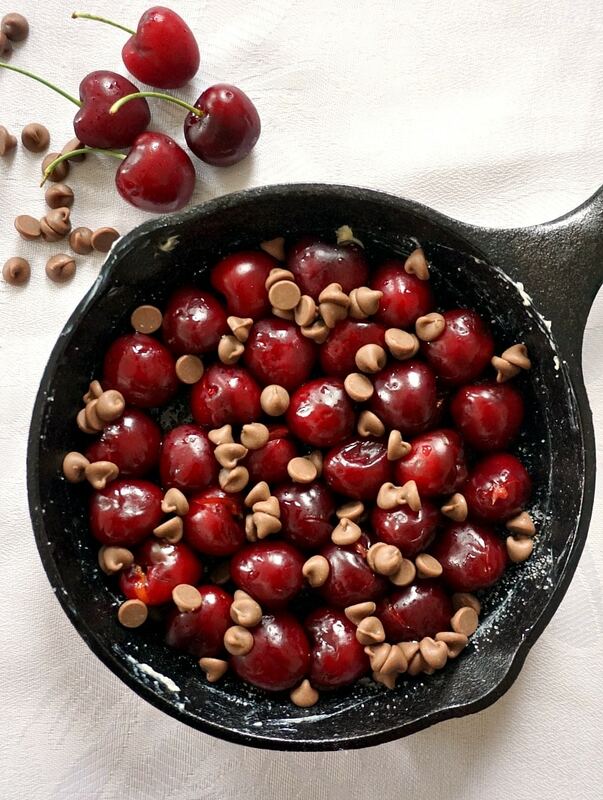 Arrange the cherries on the bottom of the skillet and sprinkle the chocolate chips over. Pour over the batter and bake for 20 to 25 minutes until set and a skewer inserted in the middle comes out clean. Serve either warm or cold from the fridge with some powder sugar sprinkled over. Wow, this looks absolutely delicious. I happen to have a bag of cherries begging to be made into this very soon! 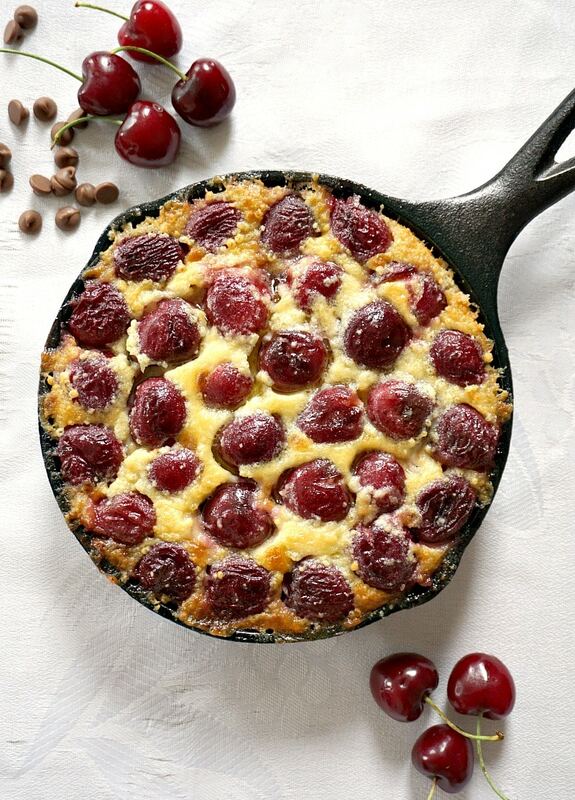 This clafoutis looks divine! I never knew about leaving the pits in! That would make the job much easier, but I would be worried about eating a pit. I agree, cherry season is much too short and we need to make good use of this perfect produce. I like the addition of chocolate, too! Can never go wrong with chocolate! Thank you! I avoid leaving the pits in for the same reason. I know that removing the pits can be a boring task, but l guess better safe than sorry. I’ve heard of Clafoutis but have never had it. It looks terrific. Do you have a sub for the almonds and almond extract? Thank you! Vanilla extract can be used instead, just double the amount and it should be fine. The ground almonds can be omitted altogether, it should not alter the texture. So pretty. I love the addition of the chocolate chips to this recipe. There’s something about the combination of chocolate and cherries that is simply divine! – Will be pulling out my cast iron and trying this recipe soon. Wow….this is a STUNNING dessert. Love using my cast iron pans too. This would be perfect for entertaining both in taste and presentation. Cherries are delicious. This is such a beautiful dessert. Love the cherry and chocolate chip combination. Didn’t know that about leaving the pits in. Interesting! The recipe says pitted which means to take out the seed aka pit. What a treat for summertime! It looks like it just melts in the mouth, I’m adding this recipe to my todo list. I love a good Clafoutis.. such a versatile recipe. Never tired it with Chocolate chips but an absolutely perfect combination with cherries! Yum! I love Clafoutis! Such a delicious recipe! I have about 2 pounds of cherries in the fridge, I now know what I am making! It’s a delicious dessert, l’m sure you’ll love it! What a beautiful dessert. I’v never tried a clafoutis — it reminds me of an upside down cake. The addition of chocolate with cherries is spot on. They make a perfect combination. 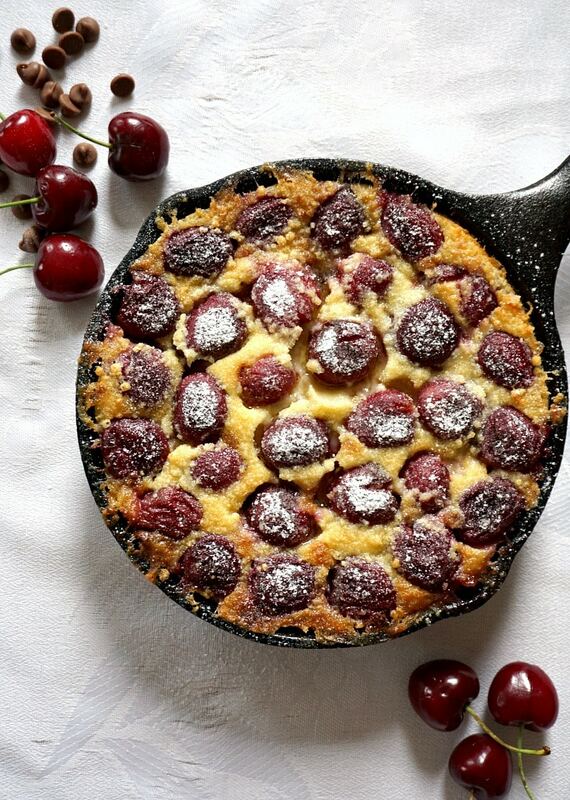 Cherries are really in season right now — this is the time for me to make a clafoutis. Thank you! I think chocolate and cherries go so well in any dessert. Glad you like it! 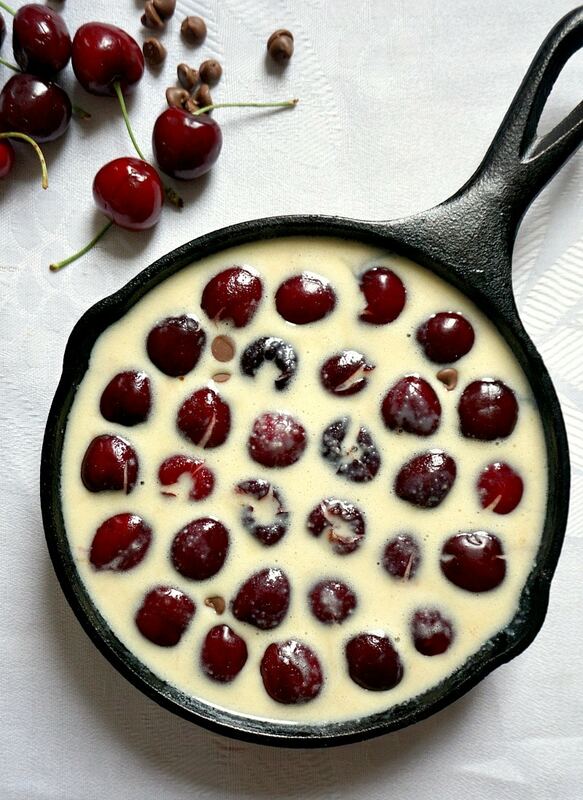 This looks gorgeous and a perfect dessert to use cherries. I love summer because of all the berry-cherry abundance and would be trying your recipe soon. Thank you, Ellie! Glad you like it!